﻿ March 2019 ASHRAE Journal Digital Edition & 2019 Annual Conference Planner - Flow Tech, Inc. 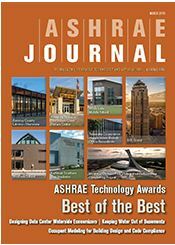 The March digital publication of the ASHRAE Journal is ready for your viewing pleasure. A new building that provides labs and shared facilities for start-up companies in New York uses a hybrid GSHP system with high performance hydronics for radiant heating and cooling. The project is a first place ASHRAE Technology winner! Other topics in this month’s issue include occupant modeling for building design, data center design and more! Click the image to view all the 2019 winners and to read the complete publication. Amazing Space at the Indian Creek Nature Center – Amazing Space at the Indian Creek Nature Center uses an integrated approach pairing low-energy building systems with high performing renewable generation systems. The HVAC design consists primarily of terminal ground source water-to-air heat pumps that use a closed loop geothermal well field as a heat source and heat sink. Ramsey County Library-Shoreview – A multi-system approach resulted in a 70% energy use reduction for the Ramsey County Library. The project’s integrated solutions included underfloor air distribution and high-efficiency condensing boilers. Energy-efficient planning resulted in 44% reduction in carbon output. Koffman Southern Tier Incubator – The Koffman Southern Tier Incubator provides labs and shared facilities for start-up companies. The project’s HVAC challenges included issues with the lab spaces and resulted in innovative solutions. The facility’s hybrid ground-source heat pumps system is integrated with high performance hydronics for radiant heating and cooling. Takenaka Corporation Higashikanto Branch Office Renovation – The renovation of Takenaka Corporation Higashikanto Branch Office is the first case in Japan where zero energy was achieved for offices in use. The renovation included technologies such as desiccant air conditioning directly using geothermal heat and solar heat, and wellness control to provide optimum temperature and airflow. 801 Grand – Using NIST’s CONTAM software to determine the 801 Grand’s volume of air needed to mitigate infiltration in the building was a key part of achieving the client’s energy goals. Since energy conservation measures were implemented from 2013 to 2016, the building’s electricity use is down 27.8%. Montreal Olympic Park’s Integrated Performance Contracting Project – Separate HVAC infrastructure upgrade projects became a global investment project for the Olympic Park. A complete steam to hot water conversion of the heating system, along with improved heat recovery and completely redesigned chilled water plant, allowed the landmark to cut its energy consumption by 34.6%. 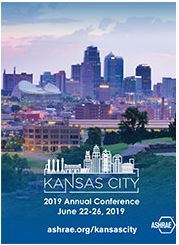 Click the image to view the complete 2019 Annual Conference planner. Registration is now open for the 2019 Annual Conference. Join us in Kansas City, MO, June 22-26 at the Kansas City Marriott and Kansas City Convention Center. Register by April 28 for the best rates!